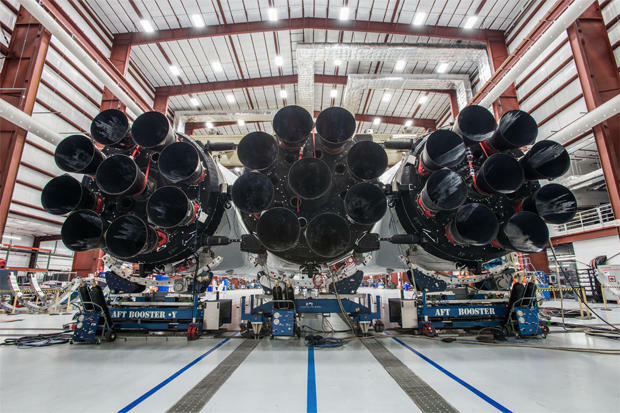 SpaceX founder Elon Musk posted the first pictures of the company's Falcon Heavy booster Wednesday, showing the powerful rocket in its hangar at the base of historic launch pad 39A at the Kennedy Space Center where it is being readied for a long-awaited maiden flight next month. The payload for the rocket's first launch will be Musk's "midnight cherry Tesla Roadster playing Space Oddity," he tweeted three weeks ago, saying the rocket will boost the electric car past the orbit of Mars on a trajectory around the sun. A specific launch date has not yet been announced. "Falcon Heavy to launch next month from Apollo 11 pad at the Cape," he tweeted. "Will have double thrust of next largest rocket. Guaranteed to be exciting, one way or another." The Falcon Heavy, made up of three Falcon 9 first stages strapped together and topped by an upper stage on the middle booster, will be the world's most powerful rocket when it finally flies, generating more than 5 million pounds of thrust at liftoff from 27 Merlin engines -- nine per core vehicle. That's enough launch power to lift 119,000 pounds to low-Earth orbit, which SpaceX says on its website is "equivalent to a 737 jetliner loaded with passengers, crew, luggage and fuel ... more than twice the payload of the next closest operational vehicle, the (United Launch Alliance) Delta 4 Heavy, at one-third the cost." SpaceX says the base price of a Falcon Heavy is $90 million, but launch costs vary widely from mission to mission and it's not yet known what the cost of an actual flight might be. A SpaceX video showing animation of a Falcon Heavy launch is posted on YouTube. In keeping with SpaceX's focus on reusability, the Heavy's two previously flown outside core boosters will attempt landings back at the Cape Canaveral Air Force Station. The center stage is expected to land on an offshore droneship on its initial flight. The second stage presumably will boost Musk's Tesla onto a solar trajectory reaching the orbit of Mars. "Payload will be my midnight cherry Tesla Roadster playing Space Oddity," he tweeted earlier. "Destination is Mars orbit. Will be in deep space for a billion years or so if it doesn't blow up on ascent." On Friday, he posted a photo of the roadster on Instagram as proof. He said "I love the thought of a car drifting apparently endlessly through space and perhaps being discovered by an alien race millions of years in the future." In 2011, Musk said he hoped to launch the first Falcon Heavy in 2013. But development was delayed by a variety of factors, including work to recover from two Falcon 9 failures, one in flight and one during a pre-launch test, and work to convert pad 39A at the Kennedy Space Center for use by SpaceX. In addition, designing and building the Falcon Heavy, making sure it can withstand the enormous structural loads of launch and the stresses generated as it climbs out of the thick lower atmosphere, has been more complex than originally believed. "At first it sounds real easy, you just stick two first stages on as strap-on boosters, but then everything changes," Musk said in July. "All the loads change, aerodynamics totally change. You've tripled the vibration and acoustics. You sort of break the qualification levels on so much of the hardware." "The amount of load you're putting through that center core is crazy because you've got two super-powerful boosters also shoving that center core, so we had to redesign the whole center core airframe. It's not like the Falcon 9 because it's got to take so much load. Then you've got separation systems." Musk has repeatedly downplayed expectations. "There's a lot of risk associated with Falcon Heavy, a real good chance that that vehicle does not make it to orbit," he said of the maiden flight. "I want to make sure to set expectations accordingly. I hope it makes it far enough beyond the pad so that it does not cause pad damage. I would consider even that a win, to be honest." It is not yet clear how the Falcon Heavy will fit into SpaceX's long-range plans. Musk announced another even more powerful rocket earlier this year known simply as the BFR, intended for interplanetary spaceflight. Initial flights to Mars, he said, could be possible by the early 2020s.